Have you entered my giveaway for your chance to win a $20 Visa gift card? Okay, I know what you are thinking. Pineapple casserole?! WHY would I want to eat something like that?? I know you are thinking this because it is what I was thinking when my mom announced it was on our Memorial Day menu. It’s also what I think when she suggests pineapple and cheese sandwiches. But like almost everything, I have been proven wrong, and my mother has been proven right. Pineapple casserole is delicious. Pineapple and cheese DO go well together and when topped with buttery crackers…yum. I have no other words. Other than you might want to find your big girl pants after this, ’cause it ain’t light. It’s a true Southern dish. Preheat oven to 375. Grease a 9×13 baking dish with cooking spray. Combine the flour, cheese, and sugar. Stir in the pineapple until evenly coated. Spread evenly into the prepared pan. 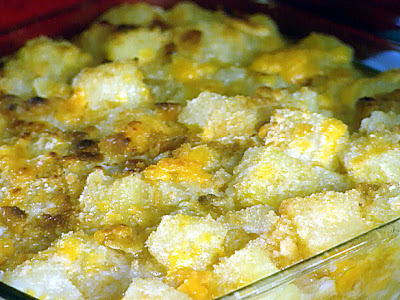 Top with the crushed cracker crumbs, and pour the melted butter over the top. Bake for 25-30 minutes, until gold and bubbly. Serve as a side dish for pork or ham. *Some recipes call for crushed pineapple, but my family likes the texture of chunked pineapple. It’s really up to you. I can’t decide if I think this looks scrumptious or absolutely revolting, so maybe I’ll just have to try it for myself! ooh, I am sure I would love this. thanks so much for sharing! !